Origin and Habitat: Mammillaria angelensis cames from Angel de la Guarda and Ventana Islands, and the region of Bahia de Los Angeles on the Baja California Peninsula, Mexico. Altitude range: It can be found close to sea level near sea level to 300 metres. Habitat and ecology: Rocky hillsides and gravelly slopes, Lower Sonoran Zone. It is threatened by habitat loss and collection of plants for horticulture. Mammillaria dioica f. angelensis (R.T.Craig) Neutel. 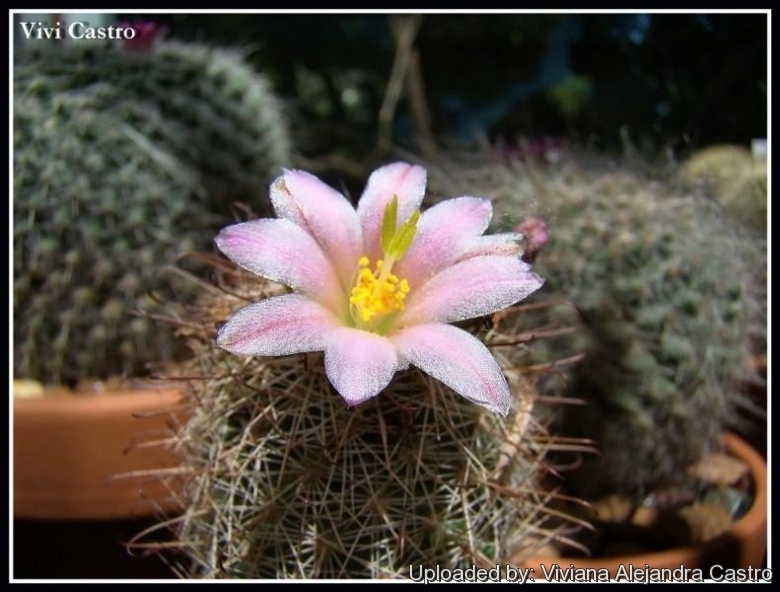 Description: Mammillaria angelensis is a small columnar cactus usually simple, sometimes clustering with white radial spines and dark brown hooked centrals. The flowers re white or pink with darker midviens. 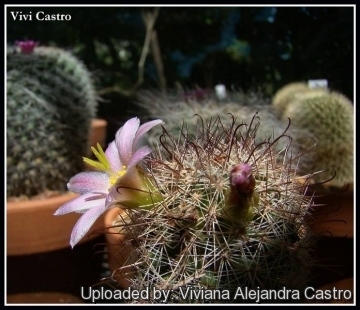 Do not confound with Mammillaria san-angelensis, a different rare specie native from close to the city of Mexico. Derivation of specific name: The name comes from an island off Lower California which is its habitat. Stems: Globose to short cylindrical, 10-15 cm high and 5-6 cm in diameter, without latex. Tubercles: Conical, terete in cross section, slightly keeled centrally, 8-9 mm. long, 6-7 mm. wide at base, blue green to olive-green, in 8 and 13 spirals, juice watery. Axil: Densely white-woolly and with 15-20 tortuous white bristles to 10 mm long. Radial spine: 16 - 20, needle-like, straight, smooth, stiff, white or somewhat tan at tip , 5 - 10 mm long, nearly horizontal except in youth when ascending. Central spine: 3 - 4, straight, purplish brown with lighter base, 8-15 mm long, lower one hooked and longer than others, all dull purplish brown or lighter at base, hooked one porrect, others spreading and not easily distinguished from radials. Flower: Up to 20 mm long and 30 mm in diameter. Outer perianth segments linear, obtuse and short-ciliate at apex. There are distinctly two colour forms recorded, the first, as originally described is white, with pinkish midstrips at the tips of the outer petals, often narrow and quite widely separated; the second form is much more deeply coloured, with deep pink petals and maroon midstripe, stigma-lobes on both forms are yellowish olive-green. Filaments white. Blooming season: In Cultivation (Europe) from Arpil to July. In Habitat from March to April. Taxonomy note: Mammillaria angelensis, Craig (Mammillaria handbook, 165, fig. 146, 1945), belongs to the Mammillaria dioica complex, and distinctions from M. dioica are not clear. M. angelensis is described and is shown in Craig's figure as having narrower perianth segments, but other plants of the Angel de la Guarda island have segments as in typical M. dioica. For his collection from Arroyo Estatón, George Lindsay noted that flowers were variable, from small to 3 cm long, with perianth segments from white with pale pink midstripe to deep pink with maroon midstripe. Both them may refer to one species. 2) Wikipedia contributors. "Mammillaria angelensis." Wikipedia, The Free Encyclopedia. Wikipedia, The Free Encyclopedia, 8 Mar. 2013. Web. 1 Nov. 2014. Cultivation and Propagation: Mammillaria angelensis is somewhat difficult to cultivate. During the summer it is best to keep the plants outside where the temperature can rise to over 30° C with no harm to the plant, recommended for any collection that needs lots of light with ample airflow.